The exhibition game between Gilas Pilipinas and NBA stars Tuesday have been cancelled by organizers of The Last Home Stand event. Reports said Gilas coach Chot Reyes announced the cancellation of the game at Smart Araneta Coliseum. An official statement regarding the reason behind it is yet to be released. However, ABS-CBN's late night news program "Bandila" reported that according to a source, the NBA did not allow its players to take the court in the absence of an approval from the league. James Harden, Nick Johnson, DeMar DeRozan, Tyson Chandler, Matt Barnes, Ed Davis, Brandon Jennings, Kyle Lowry, Damian Lillard, Terrence Ross, and NBA 2014 Finals most valuable player Kawhi Leonard are in the country for the event. Blake Griffin and Paul George were a no-show. 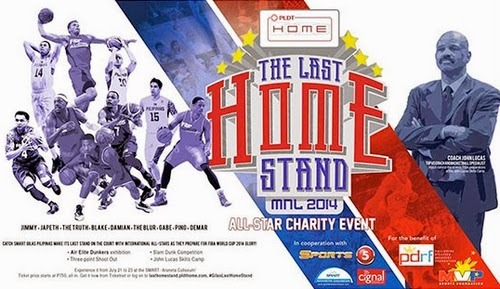 Reports said fans will be treated with a drill by Gilas Pilipinas players and NBA stars.